Who said there’s no money in non-league football, eh? Mansfield Town owner John Radford obviously has a few bob to spare between keeping his trophy loving, doting wife in collagen trout pouts and creosote tans, offering free honeymoons to his staff and flitting away £80,000 Aston Martins whenever the mood takes him. Mansfield beat Barrow 7-0 in the Blue Square Premier back in March, and Radford made a little wager with manager Paul Cox, in which he agreed to hand over the keys to his car if The Stags bettered that result when the two sides met again last weekend. Apparently, Radford phoned the Mansfield press officer once the score reached 4-1 in the first-half to say he would give Cox the keys at the interval if The Stags managed to match the “5-1” on the special personalised ‘MT51 COX’ registration plates he’d had affixed to the car. 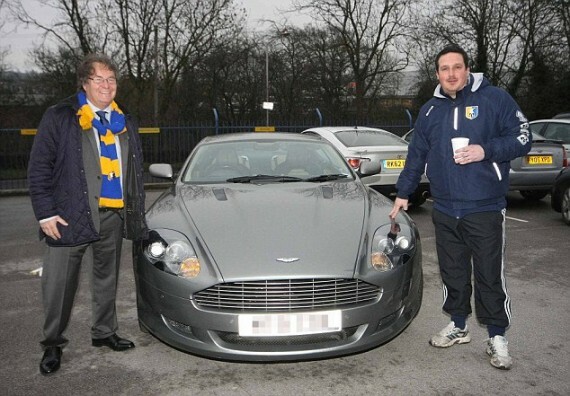 Lo and behold, when Radford turned up at half-time Mansfield were already 5-1 up, eventually going on to win 8-1 and, true to his word, the Aston Martin was sitting in the Field Mill car park after the game. “It is still all a bit surreal. We were having a laugh and a joke last Wednesday and he said something about the car which I thought was tongue in cheek after a couple of beers. “I was dumbstruck. I kept thinking it was a prank and Jeremy Beadle was going to pop out. This is just testament to the guy. He has always been honest with me, including a few rollockings, but he has never let me down and I enjoy working for him. I’m sure he’s down the street floggin that for a few thousand quid right now.